In a series of decades, Makola has grown into a densely packed lattice of streets where multistory buildings and roads teem with commercial trade in everything one can imagine – imported goods and foods, locally made African fabrics and jewelry, as well as schoolbooks, and pots and pans. 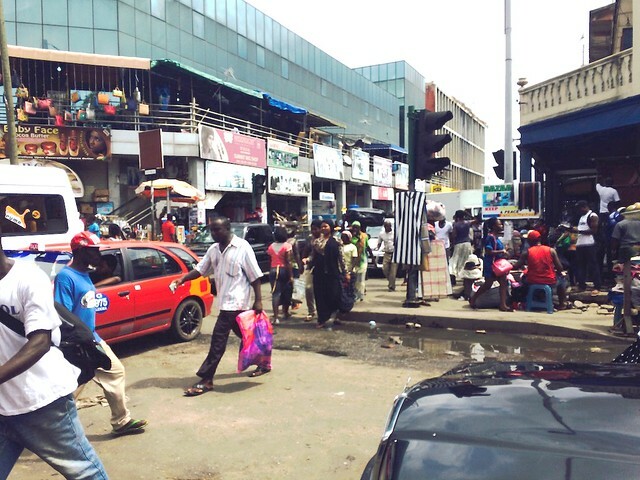 Together, Kantamanto, Makola (and the adjacent Tudu) Market form the commercial hub of Central Accra, attracting an estimated 70 percent of the city’s traffic each day. Shop owners, street vendors and customers decorate the air with the consistency of conversation and haggling in the local languages–Twi, Ga and Fante. It’s a familiar street rhythm. An old man walks along, singing to himself. Vendors call out to passersby, with greetings, hails and other attention getters, hoping to entice potential customers. 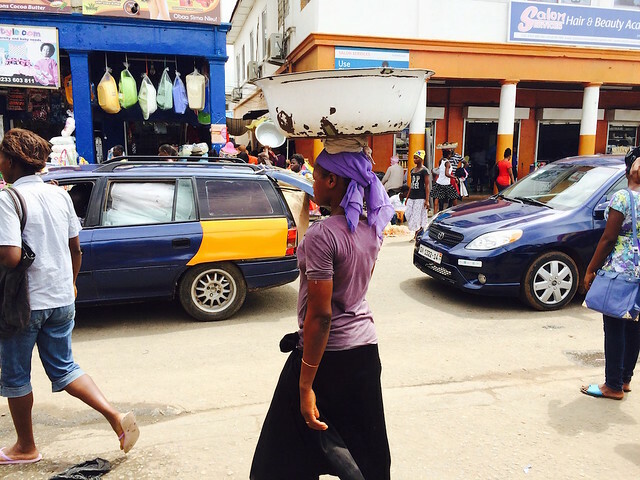 “Pure water!” calls a young female water seller, deftly balancing a load of water sachets and bottles on her head. It’s nearly empty now. Her eyes dart back and forth as she looks for potential customers in all directions. A man forms a kissing sound to call her, and she rushes over. 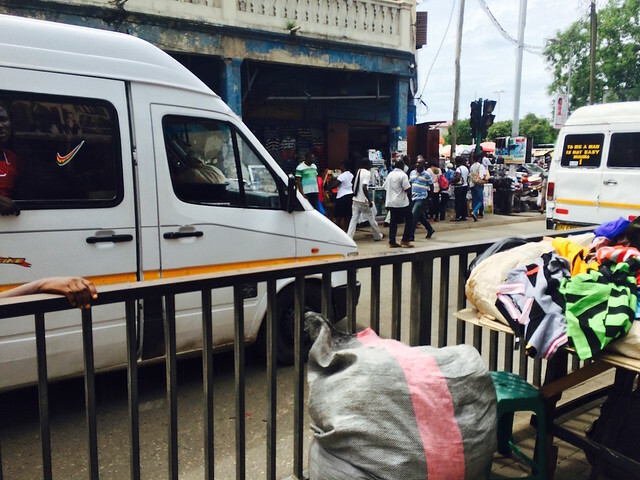 All of these sounds are a normal part of everyday hustle and bustle here, says one shop owner who’s been selling on Kwame Nkrumah Avenue for more than 10 years. Many of the vendors who sell on the Avenue have been here equally long, he adds, if not longer. It’s a hurried, purposeful space all along this street – each person, whether trotro driver or mate, shop owner, sidewalk vendor or street hawker is effectively a businessperson hustling for his or her living. You can hear a certain urgency in the sounds here. Every foot of the landscape is utilized, save for allowing shoppers access. Pedestrians are forced to weave through the traffic, making their way (quickly, but with care) dodging vehicles, products and other shoppers. Just as the air is filled with sounds, it is commercial activity that dominates this space. There’s a high level of informality, in a city where more than 70 percent of residents are engaged in the informal economy in some form. This commerce forms the heartbeat of the city – so much so that despite Accra’s growth from a city to a full-on, sprawling metropolis, locals still say they are coming to “Accra” itself when they are heading to this area. Post and photos by Victoria Okoye. She can be reached on twitter at @victoria_okoye. This is one of many posts where CoLab Radio contributors take readers and listeners on a soundwalk in their city. Read and listen to yesterday’s sound walk in Portland Maine, here. If you’d like to submit an example from your own city, see the easy steps here. A few years ago I visited Accra and went to Kaneshie Market. 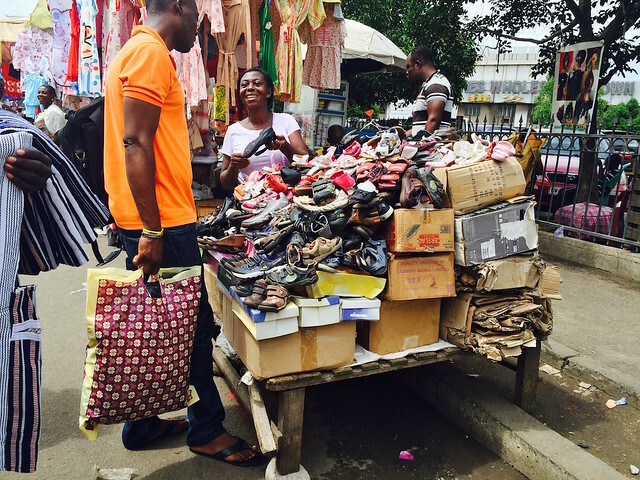 Coming from Lagos I was shocked at how the sounds of hustle in that market —the negotiations between shop owners and customers, the greetings intended to draw me into a stall or to a table— were so much gentler than in Lagos. Silence or a gentle no was not an invitation to continue as is the case in Lagos. Its funny, the friends I met in Accra during that trip spoke of Lagos as a hustlers paradise and asked about the fast paced images they’d seen of the city with such lust. Meanwhile I was besides myself that in my 5 day stay there had been no black or brown outs— at the time, a rare occurrence in my mainland Lagos neighborhood. Thank you for triggering these memories with your sound walk on Kwame Nkrumah Avenue!